40 Greene Avenue. Image: Couresy of LPC. Multiple faiths used 1864 building before it was converted into the Paul Robeson Theater. 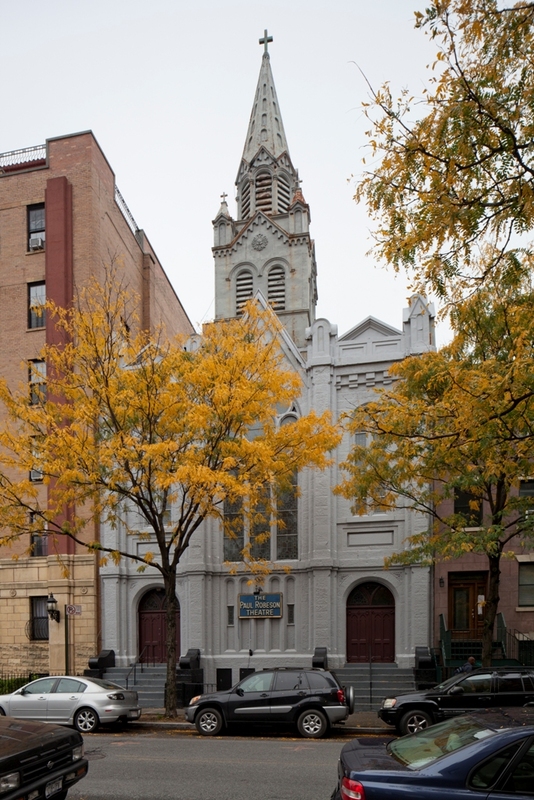 On October 25, 2011, Landmarks designated the St. Casimir’s Roman Catholic Church at 40 Greene Avenue in Brooklyn as an individual City landmark. Originally named the Church of the Redeemer, the church was built in 1864 for the Fourth Universalist Society. Temple Israel, one of Brooklyn’s earliest Reform congregations, purchased the church and converted it into a synagogue. In 1890, Temple Israel sold the building to the Roman Catholic Diocese of Brooklyn, who added a steeple and an apse to the structure. St. Casimir’s occupied the building until 1980 when it merged with Our Lady of Czechostowa parish. Dr. Josephine English, New York’s first African-American female OB/GYN, purchased the building and converted it into the Paul Robeson Theater. The building serves as an example of Rundbogenstil (roundarched style) architecture, a variety of the Romanesque Revival style popular in the late 1800s. The building features the arched windows and entrances characteristic of the style. Landmarks staff noted that the original design has been attributed to Rembrandt Lockwood, an artist turned- architect who specialized in institutional and religious buildings. The structure features a front facade of brownstone, with side and rear brick facades. The front facade’s original windows were replaced with stained glass in 1959. Landmarks unanimously approved designation. Commissioner Diana Chapin supported designating the building based on the building’s architecture and its history of religious and artistic uses. Commissioner Michael Devonshire noted the building’s significance as an example of the relatively scarce Rundbogenstil architectural style. LPC: St. Casimir’s Roman Catholic Church, 40 Greene Ave., Brooklyn (LP- 2476) (Oct. 25, 2011).